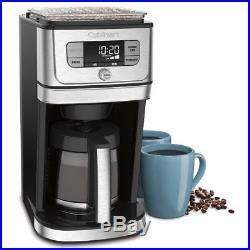 Cuisinart has once again revolutionized the specialty coffeemaker category with the Fully Automatic BURR GRIND & BREW 12-Cup Coffee Maker. This coffeemaker features an integrated vertical burr mill grinder that automatically grinds whole beans just before coffee is brewed for the freshest flavour. Auto rinse technology automatically self-cleans the coffee ground outlet and the Strength control feature lets you customize your coffee by choosing strong, medium or mild brew to suit your taste. Fully Automatic with 24-Hour Programmability- Customized flavour strength and grind control- Sealed bean hopper stores a half-pound (225 g) of beans to be fresh and ready- Brew pause feature – pour a cup while coffee is still brewing. 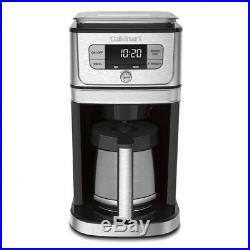 The item “Cuisinart BURR GRIND & BREW Black & Silver Automatic Coffee Maker with Grinder” is in sale since Tuesday, October 2, 2018. 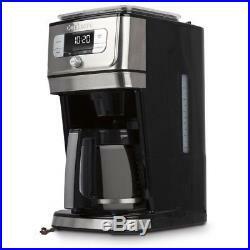 This item is in the category “Home & Garden\Kitchen, Dining & Bar\Small Kitchen Appliances\Coffee, Tea & Espresso Makers\Espresso & Cappuccino Machines”. The seller is “brandvault” and is located in H8T 1A3. This item can be shipped to Canada, United States.